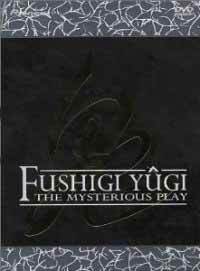 Notes: This is the only arc of the Fushigi Yugi anime series that is not tied to the original manga. The R1 release is bundled together with the six episodes of the second series, which will be discussed separately. A year after the end of the events of the television series, Tamahome finds himself drawn unwillingly back into the World of the Four Gods, and finds to his horror that he is carries the spirit of his nemesis: Nakago. Fushigi Yugi really was quite the shoujo epic back in the day. It therefore comes as no surprise that after the smashing commercial success of the television series, they wanted to make more of it. So this was the result ... and unfortunately, they've made a real mess of things here. For starters, the clean resolution of the (already-long-enough-by-far) television series is dashed as apparently we find that the deuteragonist Yui has seemingly learned nothing from her travails with the Book of Four Gods and stolen it for reasons that never fully make sense, ruining Tamahome and Miaka's well-earned happiness for the sake of a fairly badly-written coda. The main plot is confusing, frustrating, and ends somewhat ambiguously in a moment that feels more appropriate for Dragon Ball than FY, and you're probably wondering when I'm going to break out the frying pan. Not so fast, because the main plot is NOT the reason to watch this series! Instead, we get omake sequences featuring the Suzaku and Seiryuu troupes (with requisite party members clearly resurrected for this purpose) heading out on a nice outing to a hot spring resort. Now this is what we've suffered fifty-two episodes of MIAKA! and TAMAHOME! crying out to each other for? YES. I won't spoil it for you, but there is about 9000% more awesome in the extras than in the actual series ... and it's refreshing to know that the creators know exactly how silly this premise and these characters really are. As far as the animation ... well, Fushigi Yugi has never been about the animation, and it really doesn't take much to improve on the TV series, but the end result remains pretty utilitarian (with many of the better effects seemingly saved for the comedy outtakes). The music here is actually not half bad; I rather liked the themes used here, and they're one of the brighter spots of this feature. If only the main course here had showed nearly the aptitude and talent of the dessert! Alas, this first set of Fushigi Yugi OVAs is really truly rehashed material, though honestly the omake actually makes up for the substandard and forgettable melodrama we're given here. What's especially telling is that this entire continuity has been shelved by its own creators and replaced completely by the second series. In any case, whatever you do, run as far away from the English dub as you possibly can ... and be very, very thankful this isn't Eikoden! Recommended Audience: The main storyline is about on par with the TV series, with mostly fantasy peril and some violence. The comedy sequences involve hot springs sequences - nothing explicit but there's a couple of moments where censorship pixelation proves necessary. Teens and above.